While the fundamental aspects of the company provide some measure of safety and understanding of future price potential, the technical aspects of the actual stock price provide additional insight for potential price targets and also when to enter. 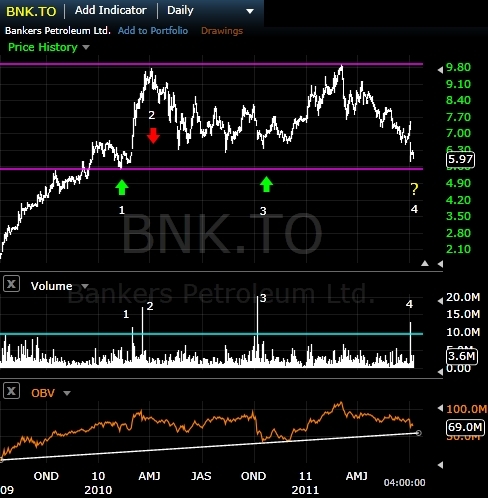 Figure 1 is a daily chart of BNK-TSX and shows that since 2010 the stock has been within a large price range between $5.48 and $9.92. This price range is marked by horizontal pink lines. This price range indicates the stock has struggled to move down to $6 since early 2010; at a current price of $5.97 (July 11, 2011 Close price) this potentially provides a buying opportunity. Note the Volume indicator at the bottom of the chart. There are four volume bars labelled 1,2,3 and 4. These represent the times over the last 2 years volume has exceeded 10 million shares/day. Each time this has occurred a major price reversal has taken place (within the range). Based on this, we are currently at point 4, marked by a “?” as the future direction is not certain. Yet the evidence points to an upside move. Massive selling volume entered the market at point 4 (July 6, 2011) and even on that volume the price could not make it the bottom of the range. This is a sign of a potential turning point. Historically a price reversal has occurred within three weeks or less following a volume spike, but price could drift lower within that timeframe. The price target is near the range high: $9.00 conservatively over the next two to eight months. This target is slightly below the most recent price high seen in April, 2011. A slightly more aggressive target would be right near the range high at $9.50. The potential exists for higher price movement, especially if the stock moves above $10. Using multiple exits may be useful, for example selling part of a position at $9.00 and holding the rest if the stock moves higher. A move above $10 provides a technical price target of $14.00. This is attained by taking the difference between the high close price and the low close price of the range, $9.85-$5.51=$4.34, and then adding that to the breakout price (old high) of $9.85, providing us a precise price target of $14.19 (It is common to round down when using this method). If the price drops below $5.50 it is an indication the stock may go lower. Just as a potential move above the current range (above $10) is likely to spur buying, a move below the range is likely to bring in sellers as all gains since 2010 would be erased and anyone who bought the stock over the last 18 months would be in a negative position. Therefore stops can be placed in the $5.50-$5.00 range to limit potential risk in case of unforeseen bad news. An additional note in regards to the chart is what is called “divergence.” Divergence is when an indicator is moving in a different direction than price. The On Balance Volume (OBV) in Figure 1 is an indicator which measures buying volume versus selling volume. The OBV indicator shows that buying volume has been trending higher while price has been range bound. Even though OBV is moving slightly lower now, the fact OBV is moving higher overall is an indicator of buying interest and that a reversal will occur at some point in price as long as the OBV overall trend continues upward. One last thing to consider is the massive short position against this stock – it is roughly 10% of the share float, or 25.5 million shares as of June 30. This up from 17 million shares short as of May 31. Currently it is ranked in the top 20 most shorted stocks on the TSX. There seems to be no correlation between stock performance and being on this list. The new short sale report from the Toronto Stock Exchange for July 15 will be released by Friday, July 22, so we can see if the short sellers have reduced their position on the recent news and accompanying sell-off. If the short position has been reduced I believe this to be a positive. If the short position increases there is a danger that a group of traders know, or think they know, something that could hurt the share price which the general investment community has not clued into yet. Looking at the volume since the announcement, I don’t believe that short shares could have been reduced by more than several million. Therefore, best case, the short shares would be about 18-20 million. Alternatively, it may have increased. “Days to Cover” the short position is at least ten trading days. Days to Cover is the approximate minimum amount of time it would take for the short sellers to exit their position assuming normal trading conditions. If the stock begins to rise before they exit, the potential exists for a “short squeeze,” where the shorts are forced to buy back their position, often causing a sharp short-term rise in the share price. Interesting though is the put/call ratio, which is in startling contrast. Since March there have been 6,116 puts and 22,198 calls. This places the put/call ratio at 0.276 over that time frame (which is the major portion of the decline). This could be interpreted as a hedge against the short, or a bullish signal in traditional terms. It also could be looked as a contrary indicator as the ratio is quite low. Therefore we have contrary indicators that conflict, and if we look at the positions in the traditional way, they still conflict. Short sellers generally do better research than investors who go long. While recent news caused a selloff in the stock, the company says it has the capacity to fix the issues. The main issues going forward will be to continue to acquire service rigs to avoid shut-in production which we saw in the recent quarter. The company is acquiring these but may need to increase that number. Also, if inventories continue to increase it could hurt short-term performance due to reduction in sales. Recent Gorami wells are doing well and show promise for the field area. Bankers will need to ramp up re-activations in Q3 and Q4 to hit their projection. Investors should also be aware there is likely a large and expensive environmental issue at Patos Marinza that somebody will have to pay to clean up at some point. Technically the stock is at the low of a price range, which historically has been a buying opportunity providing a target of $9.00-$9.50. OBV is diverging with price, indicating a reversal. If the stock moves above $10 the price could reach $14.00 while a move in the stock price below $5.50 is a warning of major investor concern. Disclaimer: The information provided is as of the date above and subject to change, and it should not be deemed a recommendation to buy or sell any security. Much of the fundamental information is based on company statements and therefore are dependent on company honesty. Trading involves substantial risk and may not be right for everyone. Certain information has been obtained from third-party sources we consider reliable, but we do not guarantee that such information is accurate or complete. Cory Mitchell owns zero Bankers Petroleum. Keith Schaefer owns zero Bankers stock. Neither the author nor the publisher have any affiliations or associations whatsoever with the company. Follow this link to watch.